The Prince Charlie Jacket is perhaps the best known of all the kilt jackets. 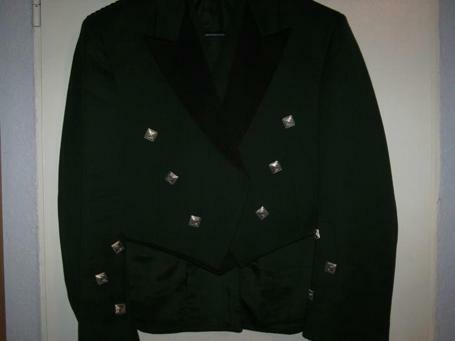 It is the one favoured by most people when choosing a jacket for evening or formal wear. This is quite simply because it is the most stylish of all kilt jackets, which shows off your kilt like no other jacket can. As you can see from the photo below it comes complete with waistcoat (vest) and is usually black in colour, but you will notice mine is in fact green with black lapels, which I chose to compliment my kilt. You will find the better kilt makers do now offer a choice of colours. The tailoring and design of the jacket and waistcoat, and the use of the silver coloured buttons on the front, arms and tails give the garment a very distinctive look which sets the kilt off beautifully. To view me wearing the jacket and waistcoat, please have a look at the photo on the Home Page. 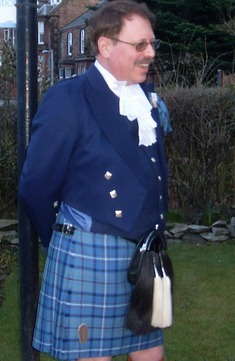 The next photo shows my brother Raymond wearing full Highland Dress, it was taken on his wedding day, and as you can see his jacket and waistcoat are black, which is still the most popular colour. The next photo on this page shows yet another colour being worn, this time blue. As I said earlier, most good kilt makers do now offer a choice of colours, so if you want a kilt jacket that stands out from the crowd, go for a colour that contrasts your kilt. At my brother's wedding for example, I was asked by several of the other guests, who were also wearing full Highland Dress, where I had purchased my green Prince Charlie jacket. The jacket is made from pure wool and as such is very comfortable to wear, and as with all quality garments, any creases from wearing fall out very easily. It has inside pockets on both sides, but I strongly suggest that you don't carry anything in them, as it does spoil the cut of the jacket. As with the kilt itself the jacket is not inexpensive, but then you do not want to combine your quality made to measure kilt with inferior quality accessories. 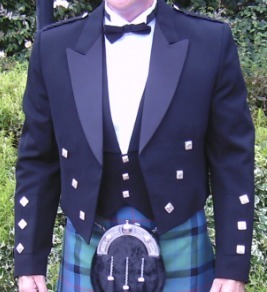 Your kilt maker will be able to advise you on the correct jacket for your particular needs, and if you are anything like me you will more than likely opt for this dress jacket, there is nothing else quite like it for formal wear.